Bus from KL to Batu Pahat is the most convenient transportation option because there is no flight and train service to connect the two cities. 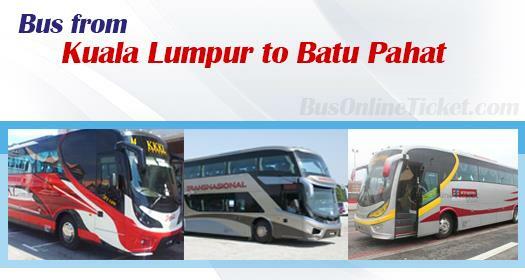 KKKL, SnS International and Transnasional are the few operators serving bus from KL to Batu Pahat. KKKL is the locals' favourite brand because of their service punctuality and hourly schedule from morning 8:00 to evening 20:00. The bus fare for bus from KL to Batu Pahat is ranging from RM 22.70 to RM 24.00. Duration required for bus from KL to Batu Pahat takes about 3 to 3.5 hours depending on traffic condition. Washroom break will be provided upon request to driver during the journey. The departure point for coaches going to Batu Pahat in Kuala Lumpur is at TBS (Terminal Bersepadu Selatan). TBS is the new and modern bus terminal locating just south of Kuala Lumpur centre. TBS is the first terminal in Malaysia operating with centralised ticketing system. The nearest LRT station is Bandar Tasik Selatan Station of the Ampang LRT line. The arrival point in Batu Pahat is at Batu Pahat bus terminal. Due to high demand for bus service from KL to Batu Pahat, commuters are advised to booking online in advance in BusOnlineTicket.com. Your booking for bus ticket in BusOnlineTicket.com is instantly confirmed upon payment. The booking process is convenient , hassle-free and reliable.